“Wheels on Fire” is the motto of the third European Wheelchair Handball Tournament, as the European Handball Federation stands by the idea of no limitations in handball, regardless of age, gender or physical condition. After two successful tournaments, hosted in Austria and Sweden, which were both won by the Netherlands team, the title holders will try to three-peat when they face Hungary, Croatia and hosts Portugal during this weekend, in Leiria. While the Dutch side won both previous editions of the competition, Portugal will hope to avenge the previous two final losses with the home support they will receive from their fans. Both Croatia and Hungary are at their first-ever European Wheelchair Handball Tournament. The four teams will play in a round-robin group stage, which will take place on Saturday and Sunday, while the two deciding games are scheduled for Sunday afternoon. Portugal and the Netherlands will throw off the tournament on Saturday at 10:30 local time in the repeat of the last two finals, with the last group game scheduled on Sunday between the Dutch side and Croatia at 11:30 local time. The final, which will feature the two best teams in the group, will take place on Sunday afternoon, at 17:00 local time. 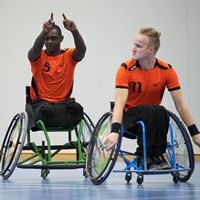 All eight games that will be played in the European Wheelchair Handball Tournament are due to be streamed live on youtube.com/ehfTV.